We often see special google doodles on special occasions, social media was bombarded with greetings or messages related to that occasion by governmental or non governmental organisations and even by individuals,we also see TV debates,newspaper coverage for such special events and days,but yesterday there was none.No prime time debates,no newspaper adds,no social media coverage,no active blogosphere,none. 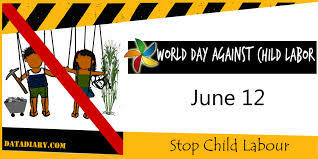 Actually, yesterday i.e on June 12, world observed since 2002 on ILO's ( International Labor Organisation) initiative " World Day Against Child Labor". But it is said or rather shameful that many of us don't know about it. This day was launched to focus attention on the global extent of child labor and the action and effort needed to eliminate it. Even after having laws against child labor and compulsory education for all we are unable to eradicate child labor from our society. The biggest reason behind this is unawareness about the issue and lack of political will. Children unaware of there rights works as domestic helps in home or as bonded labors in factories,they beg on roads for which they also pay commissions to beggar's mafia many of us feel top of the world giving charity to such children but in reality we are promoting child labor in this way,politicians and governments are not much concerned about the issue because these children are not there vote bank. No money was invested by Ministry of women and child welfare to create awareness about this issue. Lakhs and crores of children do labor at the age when they need to go to school only because we employ them in our homes and factories. It's time now for us to think and act against child labor, if we are unable in providing them food and shelter than we must not encourage it by giving alms to children begging on street,to drink tea at stalls where children are employed,to dissociate from our friends and relatives who employ children in there homes,to make such children aware of there right of education. From government side,harsher punishments should be given to those who employ children,no child work of his/her own will they are forced by parents being so poor,hence government must ensure food and work for all,more schools should open up in villages and panchayat must ensure that each child of village will attend schools,more facilities should be there in schools to minimize the percentage of school dropouts. I hope next year we all remember this day and put our efforts in eliminating this evil from our society. It is a big problem, not sure whether it can be eradicated in the next decade even!! There is no political Will on this. The RTE (Right to Education) is not being properly implemented and food security bill is being politicized; signs of our apathy to this problem. And the affluent class - for most of them this is cheap labour easily available in various occasions. Child labor is shame on humanity. The need of the hour is more stringent laws to protect children from the odds of labor.